This 350 hour manicuring course has been established for students who are interested in the nail care phase of cosmetology. During this course, each student will be introduced to nail structure and manicuring techniques with ample opportunity to apply this technique to clients in the clinic. Advanced training with Sculpted Nail application and maintenance, nail wrapping and application of nail tips is included in the course. This course should prepare the student to take the Mississippi State Board Examination to become a licensed manicurist. Total cost includes a registration fee of $100.00, kit, and materials of $850.00. If additional instruction is required after the 10 week course it may be provided at a cost of $15.00 per hour. Students are required to pay $1600 down and the remaining $1600 by the fifth week of school. Chris' Beauty College will admit as regular students, high school graduates and holders of high school graduation equivalency certificates approved by the Mississippi State Board of Cosmetology. Chris' Beauty College does not accept ability-to-benefit students. A non-refundable application fee of $25.00 is required upon enrollment. Students must complete 350 clock hours. Of those hours, 85 are to be theory hours and 265 are to be practical hours. Students must also maintain a grade average of 85% and successfully complete with a grade average of 85% any written or practical examinations. Tuition, books, materials and any additional instructional charges owed Chris' Beauty College by the student must be paid in full, or arrangements for payment made with the Director, in order to take any written or practical final examination. Upon graduation, a certificate is awarded certifying that the stuent has completed the course of study and training in Manicuring from Chris' Beauty College. Two current passport photos with white background. Attained a high school diploma or its equivalency. Successfully completed 350 hours of training in an accredited college of cosmetology or manicuring. Students who fail to pass the state license exam may receive additional instruction free from the College for the first year after graduation. Methods to be used for instruction include lecture, demonstration, and overhead projection of materials, videos, activities that require student participation, discussion and review. Know the anatomy of the hand and nail. 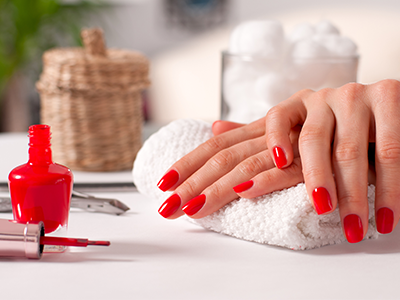 Be able to recognize nail disorders and treat them. Be able to apply artificial nails in a professional manner. Be able to perform massage techniques for arms, fingers, and hands. Be able to perform as a professional manicurist.